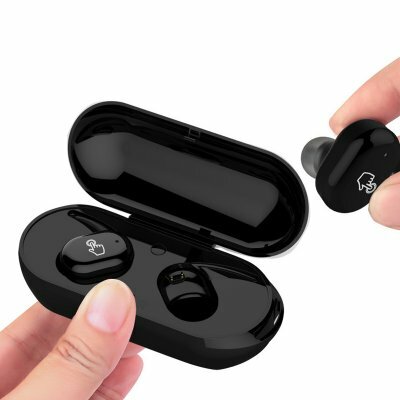 Successfully Added Dual Bluetooth Earphones - Aluminum Charging Case, Built-in Mic, Noise Canceling, Compatible with iOS and Android Phones to your Shopping Cart. Listen to your favorite songs anywhere you go with these amazing Bluetooth headphones. These wireless earphone come with a magnetic aluminum 45mAh charging box that allows you to charge your headphones on to go. Thanks to this, you can be assured that you’ll never run out of power during the day again. Additionally, this stylish case makes your ear buts easy to carry around in your pocket or bag without damaging them. Each one of your headphones comes with a built-in 50mA battery that treats you to up to 2.5 hours of continuations music listening time. Whether you’re at home, the office, or outside - from now on you’ll always be able to enjoy your favorite tracks. Thanks to its wireless design, you no longer have to deal with annoying cables while listening to your songs. The earphones have been designed specifically to fit the human ear in order to make sure they have a solid fit. You will be able to use these beauties while walking, cycling, or running without needing to worry about them dropping out of your ear. When paired with your iOS or Android smartphone, you’ll furthermore be able to answer hands free calls on the go. Thanks to this, you will always stay within reach to friends and family no matter where you’re at. By supporting Bluetooth 4,2, you can be guaranteed to undergo a smooth and lag free music experience at any given moment. What really sets these earphones apart from the rest is that they feature a single- and dual- earphone mode. When used in single mode, you can share your headphones with your friends to watch a movie or listen to music together. The latest noise suppressing technology makes sure that you can fully focus on your songs or movie without getting disturbed by outside sounds. Being able to deliver a whopping 105dB, you can be sure to undergo a stunning audio experience when using these beauties on the go.